Join Spider-Man This Holiday and Share in the Gift of Giving! Watch Tom Holland unbox the Spider-Man™: Homecoming Limited-Edition Gift Box here! CULVER CITY, Calif. (December 5, 2017) – This holiday, fans can join Spider-Man in sharing the gift of giving to children everywhere. An official Spider-Man suit worn by Tom Holland in Spider-Man™: Homecoming will be auctioned to benefit Toys for Tots. Fans can celebrate with Spider-Man™: Homecoming by participating in the auction to win the suit or by entering a sweepstakes through the Official Spider-Man Facebook Page to win a second official suit. Fans can also swing into Walmart for an exclusive Spider-Man™: Homecoming Limited-Edition Gift Box in stores today, the perfect gift for Spidey fans this holiday. Sony Pictures Home Entertainment (SPHE) is providing the first official Spider Man™: Homecoming suit to the ScreenBid online auction site to auction for the benefit of underprivileged kids through the Toys for Tots Foundation. Fans can bid on the online auction starting today by registering at https://spiderman.screenbid.com. Bidding will close on Monday, December 18, 2017 at 9 am EST / 6 am PST. In addition, SPHE will donate Spider-Man™: Homecoming DVDs to bring Spider-Man home to fans through Toys for Tots. For those who don’t win the suit at auction, a second official Spider-Man™: Homecoming suit is up for grabs through the official Spider-Man™: Homecoming Facebook page, Instagram and Twitter. To enter the sweepstakes, fans can simply take a picture of themselves showing a photo of their purchase of the new Walmart-exclusive Spider-Man™: Homecoming Limited Edition Gift Box or any Blu-ray™, DVD or Digital purchase of Spider-Man™: Homecoming at retail. Fans can then post to Facebook, Instagram or Twitter using the hashtag #SpidermanHomecomingSweepstakes for their chance to win. Launching today, the official sweepstakes will remain open throughout the holidays, closing on January 2, 2018 giving fans one more opportunity to bring an official Spidey suit home. For official rules and more details on how to enter, visit http://www.spidermanhomecoming.com/winthesuit/. A perfect gift for any superhero fan, the new Spider-Man™: Homecoming Limited Edition Gift Box is available beginning today exclusively at Walmart and comes loaded with an exclusive Funko Pop! “upside down” Vinyl bobble-head figure, only available through this limited retail offer. 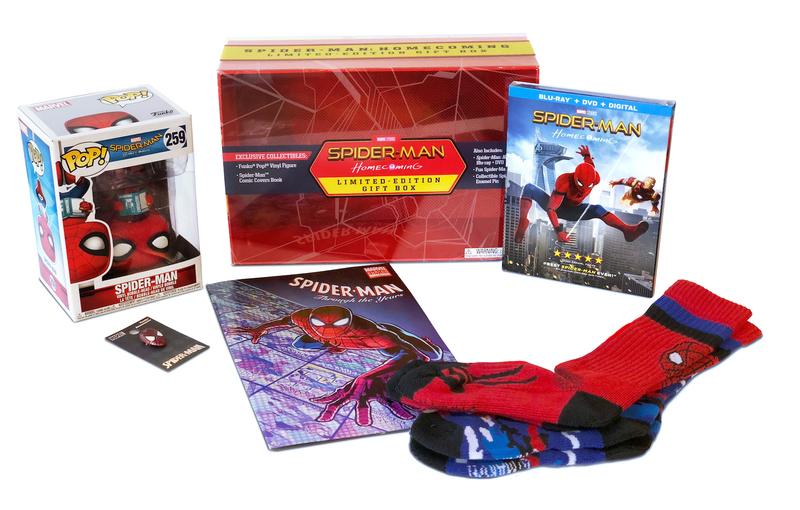 Also exclusive to this limited edition gift box is a Spider-Man Comic Covers Book called “Through the Years” featuring popular Spider-Man comic book cover art, as well as Spider-Man athletic socks, a collectible Spider-Man enamel pin, and the Spider-Man™: Homecoming Blu-ray, DVD and digital combo pack. Toys for Tots, a 70-year national charitable program run by the U.S. Marine Corps Reserve, provides happiness and hope to disadvantaged children during each Christmas holiday season. The toys, books and other gifts collected and distributed by the Marines offer these children recognition, confidence and a positive memory for a lifetime. It is such experiences that help children become responsible citizens and caring members of their community. Last year the Marine Toys for Tots Program fulfilled the holiday hopes and dreams of 7 million less fortunate children in 792 communities nationwide. Since 1947 over 244 million children have been assisted. The Marine Toys for Tots Foundation is a not for profit organization authorized by the U.S. Marine Corps and the Department of Defense to provide fundraising and other necessary support for the annual Marine Corps Reserve Toys for Tots Program. For more information, visit www.toysfortots.org. ScreenBid is the world’s best source for certified authentic, screen-used Hollywood memorabilia and collectibles. ScreenBid partners with studios to make available to the public only objects that were used on screen or in the production of a movie or television show. ScreenBid, has hosted the official auctions for Breaking Bad, True Blood, Sons of Anarchy, Justified, Boardwalk Empire, Oprah Winfrey, Ghostbusters, Grimm, Bates Motel and Mad Men, connects fans directly with their favorite movies and TV shows by making available the best props, wardrobe pieces and set decoration from the big and small screens. Bidding is easy, and every ScreenBid item comes with a studio certificate of authenticity.